Grab the attention of the next generation of fans with real massively-multiplayer mobile games played on the digital board in place of traditional commercials. 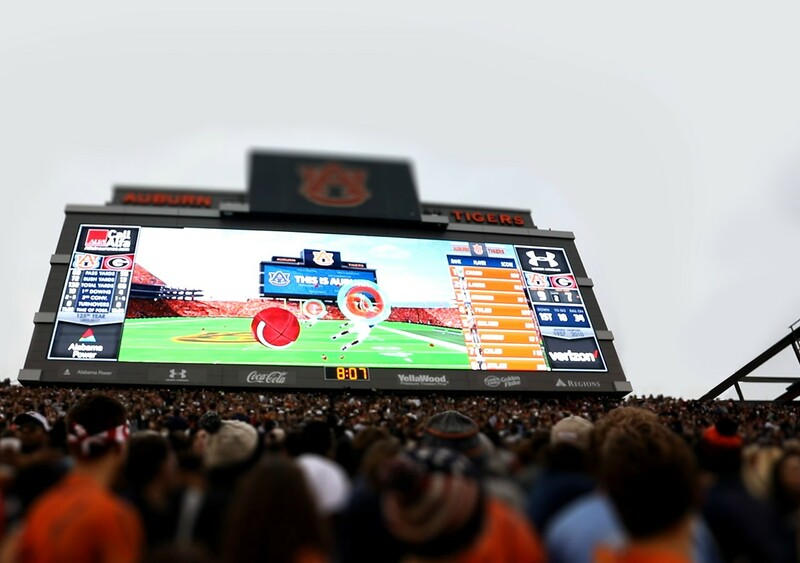 Maximize your ad time and engagement on the big board and multiply brand impressions when fans replay and practice for the next event. Our light-weight games can be integrated anywhere. Let us drive thousands of fans to your app, website, or social media presence, and when the game is over our geotargeted prizes and digital coupons directionally drive users to your promotional content and products. World class analytics and reporting lets us tune our events and optimize players' experiences. Leverage social media and location services to award fans effectively and bring them back for more! #WINNERWINNER! COMING UP IN THE NEXT BREAK! We challenged Redskins fans (and their rivals) to try their own hand at completing a touchdown for some great prizes. Fans were directed to the official Redskins app where they then connected to the Bud Light Play Live web-game. Right on time the Bud Light QB Challenge took over the stadium as fans furiously flicked their phones trying to grab one of the top 10 slots on the leaderboard. Our technology leverages a websocket connection with an incredibly lightweight datastream to ensure thousands of concurrent players can communicate with our servers, even in an environment as "data-challenged" as a football stadium. Email Us for a demo! STARTING NOW in the 2018-2019 NBA Pacers season, pay attention to the videoboard for your chance to win autographed Pacers Gear! If you were at this years Fan Jam then you know Pacers Play Live was a huge hit! We integrated right into the official Pacers app and brought an around the world shooting contest to the thousands of fans who showed up to support their team in this year's Preseason Fan Jam! Make sure to participate all season long, we've got some great prizes in store for Indiana! Play Live features a robust prize system that lets clients deliver different prizes or advertisement based on player performance, geo-location, and event type. SMS>> ATTENTION FIGHTERS FANS! Tap here to connect to the videoboard and Play Live for Fighters Gear! Play Live is international! We joined the Hokkaido Nippon-Ham Fighters in Japan and played a home run derby with the awesome fans of the Sapporo Dome. The Fighters sent out a text to all their fans in the dome with a link to "Fighters Play Live" and excited fans flooded in to participate. The Play Live Platform is flexible and can be fit to any arena environment. WIN COKE PRODUCTS & BUCKEYES GEAR! New in the BNR – Buckeye Nation Rewards App. Play in the Schottenstein Center on gameday or on your own time at home and reap in those sweet prizes + GoBucks! The Play Live Platform is your perfect plug and play solution to leverage your rewards programs. Aqumo integrated our web-game right into the IMG OSU rewards app. The Play Live Platform helps drive downloads to their new app, and the integration allows us to use their promotional systems to award awesome prizes. Live at Kashima Stadium, win autographed gear from Japan’s #1 Soccer Team, the Kashima Antlers! We challenged the 40,000 fans at the Kashima Soccer Stadium to see how many penalty kicks they could score in 45 seconds. With a long list of prizes and many events run both pre-game and during breaks, the whole stadium joined in! The Play Live Platform can fit in any sports presentation. Configure it to play “run-up” events with practice or qualifying rounds before the main event. Pre-configure events with our customized launcher and set-up multi-round tournaments with escalating prizes. WAR EAGLE! We challenged students to play for pizza in daily at-home challenges during the week in our first stand-alone Auburn Play Live App. Then during weekend games at Jordan-Hare we took over the stadium videoboard with thousands playing from the stands for autographed gear. The Play Live Platform is fun whether you are at the stadium, playing from home, or just practicing for the weekend. Aquimo Play Live Bears Down at the University of Arizona to start off home basketball games where thousands of Arizona students vie for autographed gear before tip-off. Free-throw competitions, Around-the-World, 3-point contests, Half-court contests... The Play Live Platform is agile with tons of game modes coming to all of our sports. Aquimo Founder and CEO leading strategy, marketing, business development and capital raise activities. Mark is the architect of the Aquimo collegiate licensing strategy and author of the seven Aquimo patents. He is also a professor at the Kellogg School of Management, and the author of Data-Driven Marketing, which was awarded best book of the year by the American Marketing Association. He directs the technology management and data-driven marketing executive programs at Kellogg, and is the #1 Kellogg faculty case writer. He is also a successful marketing and technology management consultant. Senior executive clients include Microsoft, Teradata, Dow Chemical and the Mayo Clinic. MBA from the Kellogg School of Management and Ph.D. from Drexel University. Aquimo Founder and Chief Technology Officer, with extensive experience in product development and managing global teams. He relocated to India in 2013 to build Aquimo’s game development center in Gurgaon and has taken the team from 0 to 40+ since with the capacity to scale quickly. He is the co-author of 5 Aquimo patents. Manoj’s expertise is in building the highly scalable platforms. He was an architect and lead developer on building the Ameritrade’s online trading platform. In the past, he has worked for HCL Technologies, Ameritrade and Coventry Health Care in different consulting and management roles. Manoj has an MBA from the Kellogg School of Management and an MS in Computer Science from the National Institute of Technology, India. Paulo is leading the Aquimo revenue generation effort for live-event marketing, freemium mobile and VR games. Prior to Aquimo, Paulo spent more than 15 years leading a 150+ person sales teams at Wells Fargo and GMAC. Paulo played minor league baseball for 4 years, and has an BA from New Mexico State University, where he was awarded ‘All Big West Conference Player’ with other MLB pro players. Aquimo Founder, Rob leads prototype, creative, animation, UI and game art direction. He has successfully delivered major iPhone/iPad Apps including Balloonimals, a top 10 children's app for 4 years and Teradata 'Learn From the Leaders’, He holds a BFA in Industrial Design from the University of Illinois. Copyright © 2019 Aquimo LLC All rights reserved.